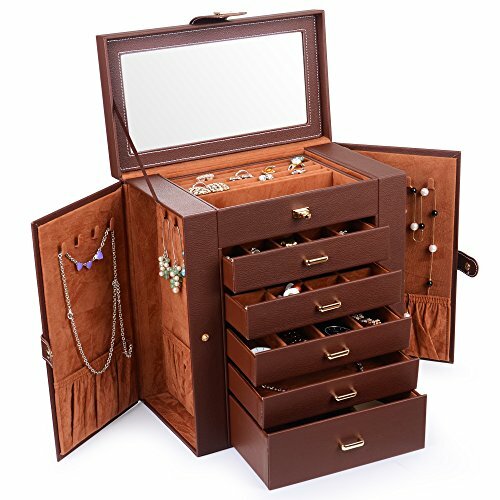 Kendal Huge Leather Jewelry Box/Case/Storage LJC-SHD5BN (Brown) | What Should I Say? Elegance par excellence. Made of the finest PU leather, innovative in design, delicious tone, this hand-crafted jewelry box features convenient compartments, unique fold out panel design for hanging necklaces and bracelets, gleaming gold-plated metal clasps and handles, and large capacity to hold even the largest jewelry collections, Showcase your collection in glamor and style in this timeless jewelry case. Life with style! Clean lined, sleek, contemporary designed jewelry box. Sturdy construction. It measures 12.00"L x 6.70"W x 12.75"H when closed. Top lid has a large beveled glass mirror nestled inside. The removable top section has 2 compartments, each size is 7.25"L x 2.625"W x 1.125" H, and one compartment has 3 suede lined ring slots. 5 removable drawers for maximum jewelry storage. The deeper bottom drawer has only one compartment. Its size is 7.31"L x 5.81"W x 2.25"H. The other 4 drawers have the equal size. Their size is 7.31"L x 5.81"W x 1.00"H. Drawer 1 has 20 equal size compartments; Drawer 2 has 12 equal size compartments; Drawer 3 has 4 equal size compartments; Drawer 4 has just one compartment.